Thur., Jan. 7–Feb. 25, 6 p.m. Para niños de 2 años en adelante. Comparta y disfrute con sus niños libros, cuentos, rimas y música en español. Ages 2 and up. Share books, stories, rhymes and music in Spanish. Sat., Jan. 9, 3:30 p.m.
Grades 1 and up. Learn this nifty paper-folding art from local master Daniel Kluver. Leave with your pockets full of animals! Tuesdays, Jan. 12, 19 & 26, 6:30–7:30 p.m. La wadaag bugagga, sheekoyinka, jaan-gooyada maansada iyo muusikada Soomaalida. Waxaa lagu maalgaliyey deeq ay For children ages 2 and up. Experience the world in other languages. Fri., Jan. 15, 4 p.m.
Kindergarten and up. Join us for winter-themed stories and crafts! Fri., Jan. 22, 3 p.m.
Kindergarten and up. Granite, slate, sandstone… oh, those rocks! What are they like? Where are they found? Are there fake rocks? Solve rock mysteries and create a piece of rock art to take home. Materials provided. Fri., Jan. 29, 4 p.m.
Grades 4-6. Join other kids to talk about a great book! No pre-reading required! We will share a story and discuss. James Womack was the grand-uncle of Roy Rogers. Roy Rogers, born in OH, to Andrew and Mattie Womack Slye and named Leonard Franklin Slye; went west in 1931 as a would be musician. In less than two years, he’d co-founded the greatest Western singing group of all time, the Sons of the Pioneers, and four years later, he’d started a career as a movie star with a new name, Roy Rogers. Apparently, a cowboy hero couldn’t be known as Slye. The name “Rogers” came from Will Rogers and “Roy” came from a list. He made his debut in “Under Western Stars”; with Roy Rogers as a new star, and his horse, Trigger. Those of us who grew in the late 1940s and 1950s, in the age of black and white movies and television, are all familiar with Roy Rogers and Dale Evans, King and Queen of the West. At the end of their weekly television show, they signed off by singing “Happy Trails to You,” a song written by Dale. Even now, most of us can still sing the song by heart. 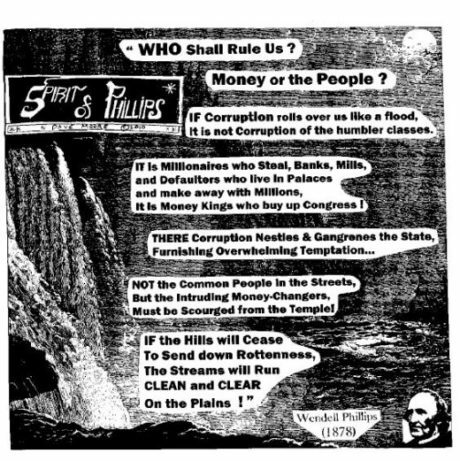 Believe it or not, that song has an interesting connection (albeit a somewhat remote one) to Minneapolis Pioneers and Soldiers Cemetery. 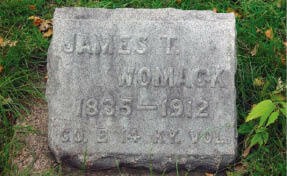 James Tignal Womack was born in Louisa, Lawrence County, Kentucky in 1835. During the Civil War, on October 15, 1861, he enlisted in the 14th Kentucky Volunteer Infantry. He was forced to resign his commission as a 1st Lieutenant a year later due to poor health. In a letter written to his colonel, Womack wrote that he had “been labouring under a disease of the Breast for the last six months, and which has been so severe of late as to Render Me totally unfit for duty…” He was given an honorable discharge for disability on October 10, 1862. It is not clear exactly when Womack moved to Minnesota, but by 1870, he was living and farming in Hennepin County. He married Frances Elizabeth Collier, and they had at least seven children, one of whom died at the age of two and is buried next to his parents in the cemetery. Womack was only one of at least eight men from the 14th Kentucky Volunteer Infantry to settle in Minnesota, although he was the only one to settle in Hennepin County. Marlitta Perkins, Regimental Historian of the 14th Kentucky Volunteer Infantry, speculated that, because Womack arrived in Minnesota either during, or soon after the end of, the Civil War, it is likely that he had “Union sympathies in a family who had also Confederate leanings.” Two of James Womack’s cousins, who were brothers, fought on opposite sides during the war, something that was not all that uncommon for families living in border states. Archer Womack fought on the Union side, and Egbert Womack fought for the Confederacy; their father, William, was jailed for his secessionist views. Over the years, the two branches of the family seem to have continued going down separate paths. There are a lot of Womacks on the internet looking for family connections; the majority of them are descendants of Egbert Womack and are connected to the Sons of the Confederacy. But, both branches of the family trace their lineage back to a man named James Tignal Womack, who was not “our” James Tignal Womack, but his grandfather. “Mr. Bussey, I never used to believe in ghosts”, Angel said, as he wiped up his coffee with the napkins the waitress had brought. The other patrons at Maria’s had gone back to their meals. “What happened to change your mind?” Mr. Bussey asked. “The sign of death”, Mr. Bussey interrupted. Mr. Bussey smiled and ate a piece of his corn pancake. “Oh, you’d be surprised what I know”. “What’s the word?” Mr. Bussey asked. “Lotten. I have no idea what that means”, Angel said. The waitress came over and filled their coffee cups. “It is Swedish”, she said. “It means ‘let’”. “Let?” Angel and Mr. Bussey said, simultaneously. They both thought they should pinky swear, for good luck, but neither mentioned it. “Yes, ‘let’, like ‘let it happen’, or ‘let there be light;”, she answered, and walked away. Mr. Bussey and Angel looked at each other for awhile. Finally the teacher spoke: “There’s the light again: Luz, Mother Light, let there be light”. “Is your grandmother still alive?”, he asked. “Yes. She lives in Guanajuato.”, Angel said. “Maybe you should talk to her”. “How do you know about this stuff?” Angel asked, amazed. “Socorro…Socorro Cruz”, and then Angel’s lip trembled a little. “Soccorro Cruz Hidalgo”. “Shut up!” Angel replied, and headed south again, towards the winter sun. Patrick Cabello Hansel, creative & amiable poet, author, dramatist, and pastor (and so, too, Luisa Cabello Hansel) St. Paul’s Lutheran Church – 28th Street and 15th Ave. in Midtown Phillips. Writes a new Chapter for Novelle Searching in each month’s The Alley. *A new chapter appears every month in The Alley. You can influence the story by contacting the author with your ideas and comments. It is with great sorrow that we start this edition of Sports Talk announcing the death of 26 year old wide receiver Chris Henry, who’s Cincinnati Bengals, had just recently been thrashed by our MN Vikings 30-10. Mr. Henry did not play in that game, in that he broke his forearm November 6, and was still rehabilitating to return to action. After a troubled start in college and professional sports, Chris Henry had started to turn his life around, and had he kept pace, would have been an excellent role model, that no matter what you have done in the past, your future can be better. What a tragedy! As one Minnesota team, The Wild, (NHL), got a little hot; the hot Minnesota team, The Vikings (NFL), got a little cold; and the cold Minnesota team, The Timberwolves (NBA), started to warm up. The only consistently good professional sports venue currently, are The Minnesota Timberwolves Dance Line. Since the NBA season start, they have at times shown better on the court moves than our T-Wolves, however, that may continue to change for the better, now that Kevin Love has returned to the line-up, and Al Jefferson is playing with more virility. Still early in the season, we both think the T-Wolves have a chance to stir some stuff up, come play-off time. NO, we are not exactly picking them to be in the playoffs, but we think their play will continue to improve and that they will be a determining factor as to who makes the playoffs. They must stay healthy to have any chance at all! Did you know that Young Dex’s favorite player, Allen Iverson, has come out of retirement, and is playing for his old team, The Philadelphia 76’ers, who will be here on January 18th, for an afternoon MLK holiday game? Bring the family to this one, and see one of the most prolific point guards ever. GO TIMBERWOLVES, VIKINGS, WILD and DANCELINE!! Demon from Hell surprises Raizo (Rain) and his party of men and some women in a warehouse suite slaughtering the men except Raizo, of course, the main character. From the opening scenes, the body count begins to soar and so does the martial arts in conjunction with sanguineous displays. 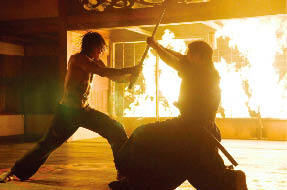 The ninjas Raizo is up against are unconscionable hired killers to steal 100 pounds of gold. (Why not go for gold the dollar is nearly worthless nowadays?] Raizo is a stealthy character who will face his nemesis, Lord Ozunu. Rain shirtless (remember Sylvester Stallone’s excellent physique “First Blood,” “Rocky, “ “Rambo:First Blood, Part 2,” etc.) packs an impressive physique with a nice six-pack of abs to go. Lots of kicking butts (literally) largely what martial arts pictures are about but do not expect anymore than a whimsical story. Howard may be reached by email. Check out his website. Building’s Foreclosure Threatens The Stevens Square Center for the Arts! Matt Wells and Eric Mattheis create a mural for The Stevens Square Center for the Arts at 1905 3rd Ave. So. Two artists worked on unusually cold October days to create a mural on the outside of the Stevens Square Center for the Arts without realizing that the building had been foreclosed by the bank. 2009 has been the most successful year to date for the Stevens Square Center for the Arts. The beautiful gallery space, transformed 6 years earlier from an essentially derelict building by a group of dedicated artists, presented the artworks of emerging artists from the city and the country in nine exhibits. Included was the “Neighborhood Show”, a non-juried exhibit that showcased the talents of artists from the Stevens Square Neighborhood and ran in conjunction with the annual neighborhood “Red Hot Art” event in the Stevens Square Park. 2010 promises to be another stellar year. Nine more shows have been chosen from twenty-three proposals including an open call show to high school students. Located at 1901 3rd Avenue South on “Arts Avenue”, SSCA provides Gallery exhibition opportunities and affordable studio space for emerging artists. With sixteen artists-in-residence, the studios are rented at 100+ percent capacity. 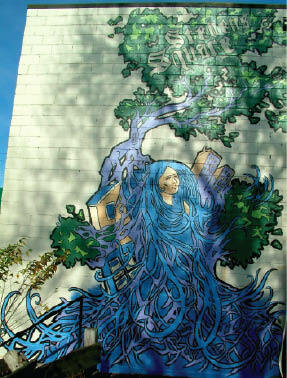 Many or our residents are MCAD (Minneapolis College of Art and Design) graduate students. Some run their art businesses from their studios. One of our residents recently returned from the International Alternative Press Convention in San Francisco where he was awarded the Isotope Award for Excellence in Mini-comics — the only award of its kind in the world. The house is packed every year with Zinefest attendees. Another of our alumni was awarded three prestigious awards for her book illustrations. SSCA has one of the only remaining darkroom facilities in the city. SSCA is a 501 C 3 non-profit educational community arts center run by volunteer members/artists. People come from many parts of the city to be a part of our community here, a gathering place for artists and community members. Each year these artists have the opportunity to exhibit their artworks in the “Annual Member Show” along with the availability of the Members Gallery where they can show works throughout the entire year. The public is invited to attend the free art openings and everyone is welcome to attend the Gallery to view the artworks for free as well. Following notice of the building’s foreclosure, we are exploring all options to preserve the Gallery and studios so they can remain accessible to emerging artists well into the future. Trish Brock is Minneapolis Arts Commissioner for the 6th Ward, and Secretary on the executive board of the Stevens Square Center for the Arts. She is an exhibiting artist and has a studio at SSCA. All residents of the four Phillips neighborhoods, Corcoran, Central, and Powderhorn Park are invited to a celebration of the first anniversary of the Backyard Initiative at the Cultural Wellness Center on Saturday, January 30, 2010. You will hear about the accomplishments of the past year, particularly about the assessment of the health of the people within these communities, as well as plans for 2010. At the December dinner and dialogue meeting, we celebrated the commitment of residents throughout the past year. Participants gave feedback on whether they thought the meetings have been open, empowering, motivating, informational, and useful, and whether they felt that trust was building. The consensus was that the meetings were all of the above, and that trust was building. Several people reported that they had been to 20 – 30 meetings during 2009, including the large dinner and dialogue gatherings and/or the meetings of the Citizen Health Action Teams (CHATs), the Assessment Team, and the Listening Circles Analysis Team. Molly Herrmann of Tastebud, a catering business at the Midtown Global Market, spoke to the group about the value of locally-produced food. Local foods are usually fresher, have more nutritional value, and are often less expensive because they have less distance to travel to get to your table. Many of the businesses in the Midtown Global Market sell locally-produced food. She said many small, local farms sell organic produce (no pesticides), but cannot label their foods as organic because of the lengthy and costly process for becoming certified. A participant said that, because buying organic can be expensive, she has found out which fruits and vegetables have the most pesticides: bananas, potatoes, strawberries, for instance. These are the ones she buys organic. Herrmann is a member of Kitchen in the Market, a cooperative kitchen in the Midtown Global Market. About ten individual businesses share the kitchen. She will be offering a family cooking class starting in January, as well as cooking classes for youth. The classes will include how to shop for inexpensive ingredients. The vendors at the Midtown Global Market are committed to bringing healthy foods to the community as well as green practices. Efforts are now underway to have all the utensils and paper plates served with food to be biodegradable, and vegetable scraps are being sent to Little Earth for their composting project. The participants discussed where they get their cultural foods. Many said it has become easier to find cultural foods. Herrman encouraged everyone to request a food from a vendor if they do not see it. Many vendors will order it for you. At the end of the meeting, a new CHAT was formed with nine members to look at nutrition and healthy food. It was agreed that healthy food and a robust local food system are essential for a healthy community. Participants talked about the importance of holding on to cultural foods and food traditions, and how their people’s health suffers when they switch to an American, fast-food diet. After the meeting, the participants shared cultural foods that they had brought, including Hoppin’ John (with black-eyed peas), Ethiopian dishes, Native American fry bread, and pico de gallo. Call the Cultural Wellness Center at 621-721-5745 for more information about the Backyard Initiative and the January 30th community celebration. What broad transformations have you seen occur with Latino businesses on Lake Street (as a result of Lake Street resurfacing, city ordinances, etc.)? Just to be clear, it was not a resurfacing road project, but a once-every-50-years project that included replacing water, gas and electrical lines beneath the street. The street was dug out to the bottom, removing old cobblestones and rail track that had been buried for decades. While Lake Street was always open one-lane in each direction, there was no parking and huge holes to traverse from one side of the road to the other. Ethnic businesses of all kinds fared better than most others during our recent road construction because of their customer loyalty. That held true for Ingebretsen’s Scandinavian customers as well as Saigon Garage’s Southeast Asian customers, but perhaps not so strongly for the Mercado and other Lake Street Latino businesses. Since road construction, business has improved despite the recession. Unfortunately, now the cost of doing business has risen and all businesses, but especially many of our Latino businesses, are finding it harder to increase their revenue to match the increased expenses. Regarding City ordinances and fees, Lake Street Council has worked diligently with City staff and elected officials to change City ordinances that negatively impact our small business community and especially our Latino and other ethnic businesses. One example is hours of operation. Several of our Latino eateries have applied for variances to serve their 24 hour clientele. Not everyone works a 9 to 5 job. Another is our support of businesses like El Nuevo Rodeo and La Vina. Dance and social halls have been mainstays of every new immigrant’s experience, going back to Scandinavian, Greek, German and every other major immigration to Minneapolis. Why the City and some of its residents see the upscale downtown entertainment district as the only home for these kinds of businesses is beyond our comprehension. In fact, these dance and social halls can be anchors for revitalization of our commercial corridors and neighborhoods as they were during past waves of immigration. Finally, we’ve also addressed problems with small grocer licensing. Groceries occupying less than 2000 sq. ft. were limited to selling only imported product. So our ethnic grocers couldn’t also provide staples like bread, butter, eggs and milk. Again, immigrants have always depended upon their ethnic grocers. I can remember my mother sending me to the German grocer. Not allowing these grocers to sell the staples, forced customers to shop twice and was driving their business to retailers like Cub Foods. This ordinance has been revised thanks to our diligence. There was an ordinance introduced this year to eliminate sandwich board signs. We fought it and won. Sandwich boards are the best marketing tool for our Latino businesses on this commercial corridor. What do you think are the contributions that Latino businesses on Lake Street have made to the city economically, socially and/or politically? And how do you think the city has contributed to Latino businesses on Lake Street? In what areas are the businesses lacking support from the city? Latino business owners have made substantial investment in the Lake Street commercial corridor over the past 10 years. Investment, without which, you would not see the dramatic positive changes we’ve experienced: more business, more residents, more events, and less crime. Our immigrant entrepreneurs have made Minneapolis the great City it is and the timing for our more recent Latino immigrants could not have come at a better time. They’ve brought critical commitment and investment to a City that needed both their financial investment and their enthusiasm for revitalization. Most of our elected officials are well aware of what the Latino investment in this City has meant in terms of businesses, organizations and projects that are helping to define the future for Minneapolis. One area of concern to our members is the loss of low overhead places to start a business. The success of public investment is gauged by increases in property values, but a city with no low overhead places for beginning entrepreneurs will suffocate itself. Just as a commercial corridor needs businesses of all sizes, so a city needs areas of higher and lower overhead to meet the needs of all its citizens and provide places from which to grow. Anyone with a heart understands that President Obama is caught between a rock and a hard place on the question of Afghanistan—damned if he does, damned if he doesn’t. As for the public’s opinion, it is mixed, uncertain, and fluid. A significant poll released November 30 indicated that 47 percent of us favor some increase in troop levels, but this figure actually was down 5 points from the previous poll. So, the belief that homeland security is sustained by war abroad appears to be waning in the midst of local economic woes. “Too costly and destined to fail” is a commonly expressed view. The question remains: Did the president’s December first speech muster the call for a ‘just war’? Truthfully, he invoked the security issue without reference to a moral imperative with regard to internationalist duty. The isolationist tendency remains strong. So, the answer is no. Yet, on the moral front, our peace movement is also subject to questions. Foremost, what consequences for women and children would result should the Taliban reconsolidate their power? Furthermore, what would be the consequences with regard to regional stability and development? Such questions might augment the president’s stance were he not marching behind the banner of NATO. There has been no pledge against the establishment of permanent military bases, no pledge against dispensations for certain corporations, no pledge against the imposition of “free trade” agreements, etc. Our obligation to oppose imperialism remains. Answer: There is a regional alternative to the escalation in Afghanistan. The Shanghai Cooperation Organization took shape in the years of Taliban power (1996; 2001) for the purpose of undermining that power. The SCO includes Russia and China along with various Central Asian states that border Afghanistan. China alone sustains a military force of some 2.5 million individuals. So, the fact is this: The refusal to enlist the SCO member states as part of our anti-Taliban coalition puts the lie to the assertion that we are in Afghanistan primarily on the basis of national security. Clearly the anti-Taliban coalition might be expanded 100-fold, not for the purpose of waging war, but for the purpose of initiating peace negotiations. The Taliban are not borderless jihadists (they are not Al-Qaida). On the contrary, they are nationalists seeking territory on which to impose their regime. With Kandahar conceded as their capital in the south, they might readily be compelled to accept Kabul as capital of the north. In the long-view, Kabul would prevail in a peaceful competition. Final thought: It remains appropriate to respect our president even as we profoundly disagree with his judgment regarding Afghanistan.